It’s possible to see many of Manchester’s important sights in a 3-4 mile tour of the older part of the city, which is located on the east side of the River Irwell. We start near the Victoria train station, which is where the Chetham’s Library, National Football Museum, and Manchester Cathedral are located. 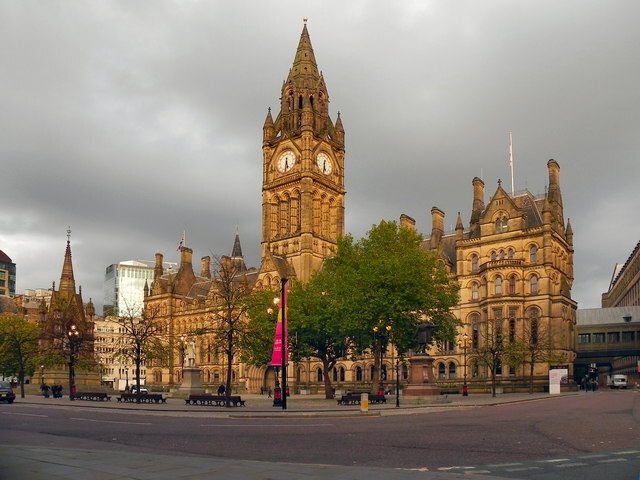 Run on Exchange St. and then on Cross St., through St. Ann’s Square and then Albert’s Square, passing by St. Anne’s Church, the iconic Manchester Town Hall, a the Manchester Central Library, and St. Peter’s Square. Just past the Library, hop on Oxford St., — a main commercial street — to the Rochdale Canal Path for about a mile to Castlefield Basin. Run around the basin to Liverpool St. and the Museum of Science and Industry. For the final mile, run along the River Inkwell, crossing New Quay St. to the west side of the river, by the People’s History Museum. Long Run Option: For a longer run, we’ve designed a loop heading north on the River Irwell path, for up to 4 extra miles, along the river and up to The Meadow and Peel Park. Pleasant greenway and paths. Sites include the University of Salford, and the Salford Museum and Art Gallery. Start the long loop at Blackfriars and Chapel St.
Add-On: For a longer run, continue along the canal path to the Quays.